A FORMER soldier who is devoted to promoting world peace says our real enemies are not guns or wars – but the physical and emotional harm we do to others simply because we have not been taught to eradicate it from our nature in childhood. 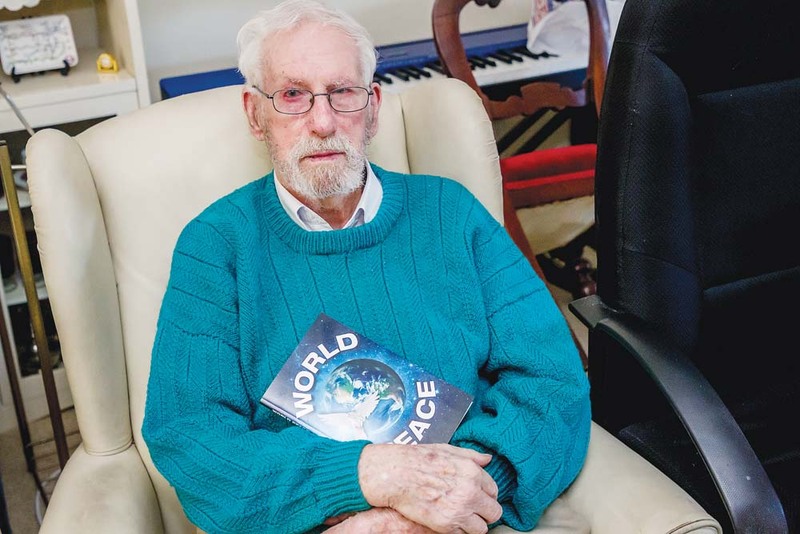 Ninety-three-year-old Baxter man James Hearn says the research he conducted for his book World Peace identified the “harmful side of human nature” as mankind’s “one and only foe”. “I believe getting rid of the harm we do to others is our only solution to world peace,” he said. “It is the only enemy which mankind has failed to recognise and getting rid of it would change human nature for the better. The background to Mr Hearn’s “lifetime’s work” started at a young age when the former Moorooduc schoolboy overcame a series of nightmares which he identified as his defeat of good over evil. Soon after, the death of his best friend early in World War II steered his thoughts towards the evils of war. “What immediately came to mind then was that mankind is not stupid and there had to be an answer to war,” he said. “From then on I began to look for the answer and my search ended 34 years later – in 1979 – when I realised we had been fighting the wrong enemy. Over the next 20 years the prolific letter writer had more than 100 letters published in newspapers until, in 2006, he began writing his first book: The Hidden Mysteries How to Live. It was published in 2012. Sadly, he says he finds politicians, leaders and the world press “uninterested in my answer”. “Is it to do with money and the fact more is being made in wartime?” he asks. Condensed into easily digestible chunks, his World Peace book now in its seventh edition promotes the idea that most of human nature cherishes love and understanding over hurting people. The tragedy is that ideals of harm and violence have been handed down through the generations via literature, movies, TV shows, and news bulletins. “How silly can we be?” he asks. And this message has to go global so that people all over the world are on the same page and children are taught to care for others from an early age. “Primary schools should teach values before skills and not leave it to parents to teach values and behaviour,” he said.